Waters has created custom wearable art for artists ranging from Lady Gaga to Motley Crue for over ten years – and his work has been used in numerous television and film productions such as the From Dusk To Dawn series, Sin City 2, Battle Angel Alita and more. Nightclub Kolis will be the place to be in London on November 23 for rock stars & fashionistas alike. Catch an exclusive sneak peek of the new Junker Designs collection and a chance for attendees to see Junker’s cutting edge clothing rocked on the runway by beautiful alternative fashion models. Following his provocative fashion debut, fashion designer and frontman Tod Waters will continue to electrify the audience by presenting brand new live music from his band DieFast performing alongside friends BESUREIS and This Years Ghost; all in the name of “Rock and Fashion for the Burundi Tree Project” in order to benefit and raise awareness for Jane Goodall’s Roots & Shoots Program and ALL the musicians performing that evening will be rocking Tod Water’s Junker Designs on the stage TO BOOT! Proceeds from the event will benefit Jane Goodall’s Roots & Shoots Burundi Tree Project, which strives to plant trees in deforested areas of Burundi, benefiting both humans and the area’s chimpanzee population. While alternative fashion might seem a world away from the threatened deforested areas the Tree Project is helping, Junker Designs is rising to the challenge to help raise funds and spread awareness of this important issue, doing their part to ensure a future for the world’s forests and chimpanzee population. ABOUT JUNKER DESIGNS – Texas-based Junker Designs (est. 2001) creates one-of-a-kind, hand-made clothing from pretty much anything that the label’s designer – Tod Waters – can acquire. He overdyes, paints, mutates, buries, or otherwise ravages each and every edgy, rocker-chic piece. Tod is available for press, radio and television in person or on the telephone in London from November 14th through November 24th. 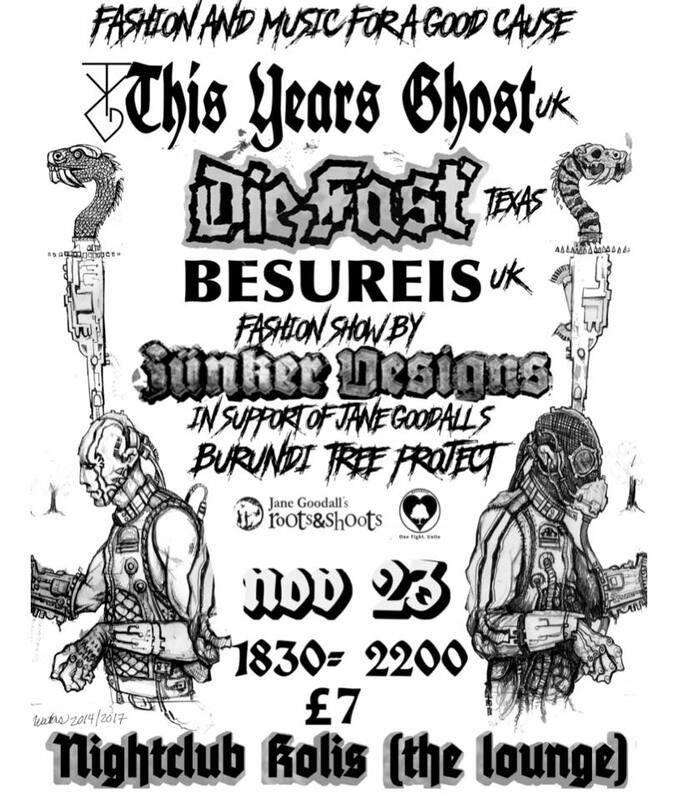 DieFast, Junker Designs, Junker London, Tod Waters. Bookmark.